Crystal Creek Lodge is located 5 miles East of King Salmon, Alaska. 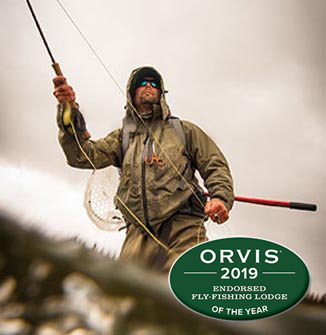 This world-class Bristol Bay fishing lodge is an award-winning Orvis Endorsed Lodge, consistently demonstrating its exceptional fishing, facilities and commitment to excellence in service. The guided field program at Crystal Creek Lodge is about variety. Our guests fish for rainbow trout, char, grayling and salmon. They will either fish the Naknek river, which runs past our front door, or fly out in a sea plane to visit hundreds of miles of surrounding area rivers and streams. 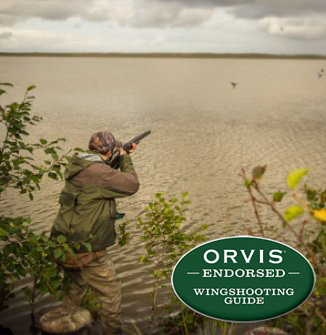 We also feature bird hunting and a wide variety of adventure and nature related activities. 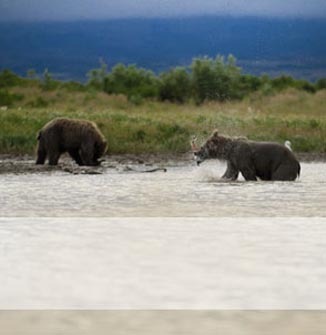 Welcome to the land of dreams: the Katmai region of the Bristol Bay area and the greatest freshwater river and stream fishing in Alaska, if not the entire earth. Perhaps we should say: welcome to the land of reality. Bristol Bay rivers have the largest Pacific salmon runs on earth. The rivers and streams of Katmai are infused with wild Alaska rainbow trout and grow some of the largest trout on earth. The Naknek River, home water of the lodge, grows trout upwards of 30 inches. Arctic char and grayling also inhabit these waters in prolific numbers, and the combination of salmon, trout and char make for a fishery of intense productivity and diversity. Since 1988, Crystal Creek Lodge has fulfilled countless dreams in its history, yet the concept is constantly tested and crafted by Dan Michels and his staff of dedicated men and women, people who share the vision of consistently delivering the finest Alaskan luxury fishing vacation possible. Our mission statement for our Alaska Fishing & Adventure Lodge is: “Inspirational Alaskan Adventure, Exceptional Hospitality”. Time afield is precious and essential to the spirit. A vacation is about rejuvenation. You might as well have the best. At Crystal Creek Lodge, you can take part in unique experiences in parts of Alaska that most people only dream of visiting. 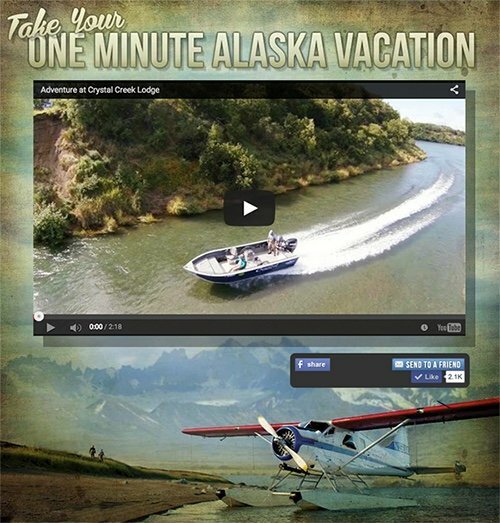 Watch our One Minute Alaska Vacation videos and see for yourself all the possibilities. You can design an exclusive and off-the-beaten-path adventure itinerary based at Crystal Creek Lodge to trek across the sky of Southwest Alaska. Fish for large rainbow trout or feisty salmon. See a region that is remote, dramatic and incredibly diverse. You’ll be hundreds of miles from the thousands of tourists mobbing the popular cruise ship ports or highway-accessible regions of the State. The best part is you might be the only visitor of the day to some of the more exotic places we visit. Be inspired by wild Alaska. Save us a minute each month, when we release the next One Minute Alaska Vacation. Until then, remember: there are 10,080 minutes of adventure packed into every week at Crystal Creek Lodge! Operated by the same owner/manager who began as a Crystal Creek Lodge guide in 1988, associated with Orvis as an Endorsed Lodge since 1991 and twice awarded Orvis-Endorsed Fly Fishing Lodge of the Year and 2015 finalist, Crystal Creek Lodge offers guests a unique combination of field and stream diversity, the highest guide, staff and aircraft to guest ratios available in Alaska and inspired lodging and hospitality. The surrounding Bristol Bay Region and Alaska Peninsula inarguably offer the most diverse and productive freshwater fishing opportunities on earth. Mix your fishing trip with spectacular wildlife viewing and adventure activities in nearby National Parks and Wildlife Refuges. Compare offerings and decide for yourself if Crystal Creek Lodge offers the most comprehensive guided fishing and lodging packages available in Alaska, if not anywhere.